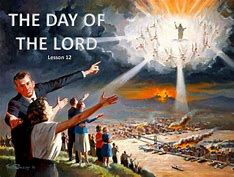 We have dealt with the Day of the Lord before, but in this edition of MOB we will look into the Day of the Lord with a great degree of detail. 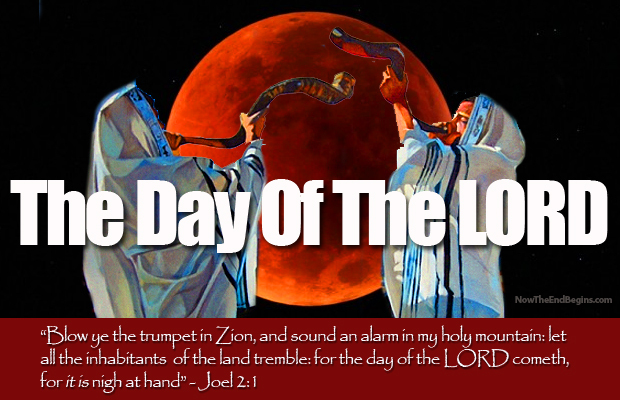 Joel begins to discuss The Day of the Lord in Joel 1:15 stating, Alas for the day of the LORD is at hand, and as a destruction from the Almighty shall it come. 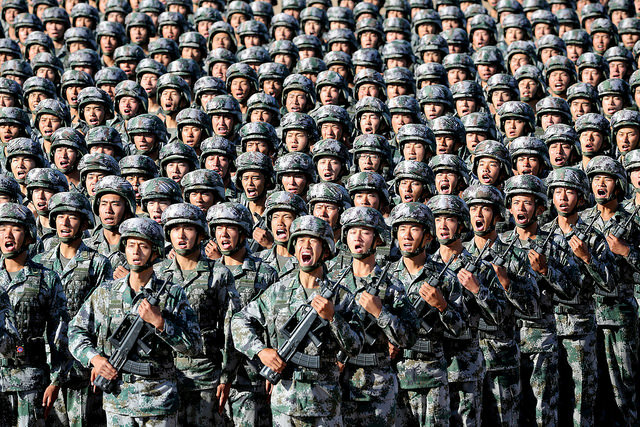 the armies of God (even Spiritual Chariots with horses have been described in scripture). The Day of the Lord is indeed a day of darkness whereby even the clouds have a thick darkness to them. 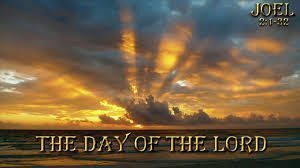 There is no other day on the Earth like the Day of the Lord, there never has been, nor ever will be. As we have discussed in the past, the Day of the Lord is a time of great judgment and even destruction. Everything from locusts, to earthquakes, incredible darkness even the moon and stars will withdraw their luminance. All will be pitch black. 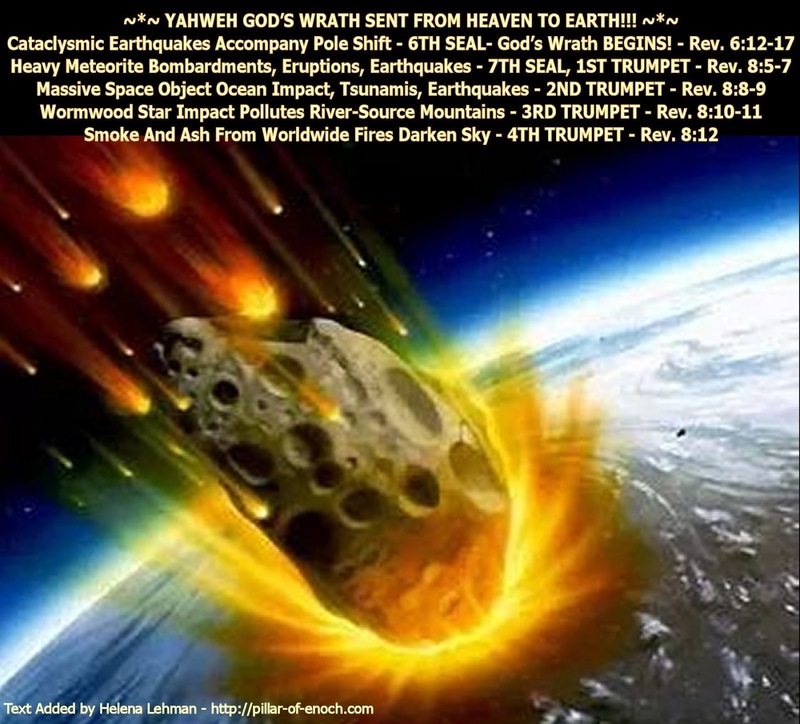 Some of what is described in Joel Ch.2 echoes the exact same description that can be found in The Book of Revelation Ch.9:1 when the 5th Angel blows the fifth trumpet. What happens next? A star falls from Heaven unto Earth and to him was given the key to the bottomless pit. Now who is him? Let’s read on, in Revelation 9:2 And he opened the bottomless pit: and there arose a smoke out of the pit, as the smoke of a great furnace; and the sun and the air were darkened by reason of the smoke of the pit. Out from this smoke come locusts and they are not normal scorpions, they have supernatural powers. All those not sealed of God in their foreheads would be tormented, but not killed. This would go on for 5 months. Men will want to die, they will be in so much pain, but they won’t be able to. Ch .9 goes into great detail about these locusts but back to who is the one to open the bottomless pit, who is the one with the key to it? Well we know who the angel of the bottomless pit is, it’s Abaddon, or Apollyon in Greek. Many scholars believe it’s Satan who falls from Heaven. Some make the mistake in thinking an angel of God opens the bottomless pit but the way the sentence is put together even in old English makes it clear, that God has allowed Satan himself to obtain the key to the bottomless pit and open it up, unleashing evil for a short time. The reason for the confusion is because Revelation 20:1 also speaks of an angel coming from Heaven, having the key to the bottomless pit and a great chain in his hand. This time it’s for the purpose of throwing the dragon, the old serpent, Satan in the bottomless pit for a thousand years so that the millennial kingdom can finally begin. 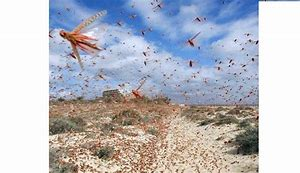 Back to the locusts for a moment, they are unmistakably a direct judgement from God upon Judah and all those that rebel against God. There is a reference to the Garden of Eden in Joel 2:3 but whatever was left of it, may have been destroyed. The land was described as like the Garden of Eden in front of them and nothing but desolate wilderness behind them. Nothing escapes the path of the locusts. It is here where the description gets interesting in V.4 and V.5. They have the appearance of horses and horsemen, so actual riders appear to be on their backs. Also the locusts are compared to the noise of the chariots that can be heard on top of the mountains (as we discussed earlier). The next few verses speak of utter chaos and madness with people running around, some are trying to kill themselves and not being able to (for the locusts will not let them die). The people will run like madmen and women to any place they can hide. Then in V.10 comes a massive earthquake on top of everything else that has already happened on the Day of the Lord. The earth shall quake before them; the heavens shall tremble; the sun and the moon shall tremble: the sun and the moon shall be dark, and the stars shall withdraw their shining. The Lord will shout with his voice as he stands before his army (his angelic host). The Lord then pleads with Israel to repent of it’s sin right there and then. God could have done one of two things, he could have lifted the judgment (but that would mean he would have to change his mind and God is not going to go back on his word. Secondly, God could just let the judgment continue. God is not purging the people out of anger as some may mistakenly believe, he purges out of love. He wants to be able to maintain some of his creation and not have all of it destroyed in his wrath. 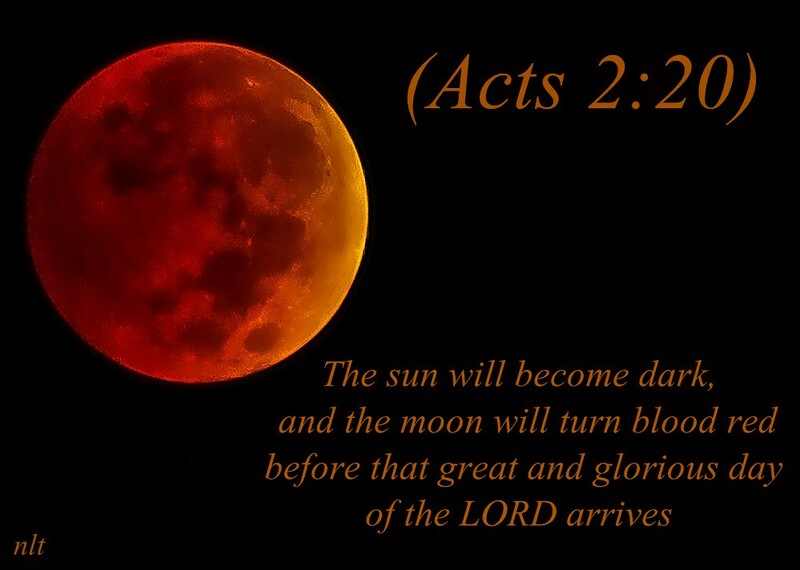 The Lord wants to show his mercy even now despite the great wrath displayed during the Day of the Lord. God wants Israel to know he plans to restore the land and it’s people. The Lord will have pity on his people and he will remove all the plagues by which he had punished them with. 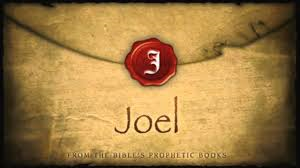 Then comes the great promise in the Book of Joel in 2:28 And it shall come to pass afterward, that I will pour out my spirit upon all flesh; and our sons and your daughters shall prophesy and your old men shall dream dreams, your young men shall see visions. Some think this verse was only meant for the Day of Pentecost when the Holy Spirit came unto the disciples. Still others say that a number of the prophecies were never fulfilled in the time of Acts. The part about dreams and visions and prophecies really did not happen for the most part during this time frame. 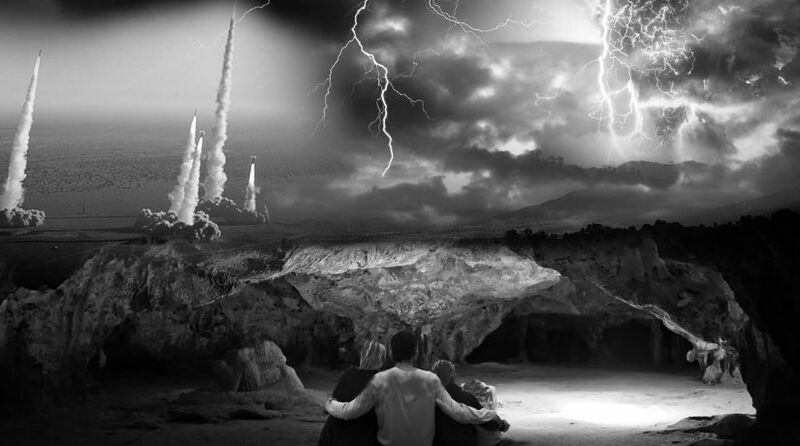 So this group believes that the second stage of fulfillment will happen during The Second Coming of Yeshua the Messiah at the end of the Great Tribulation. 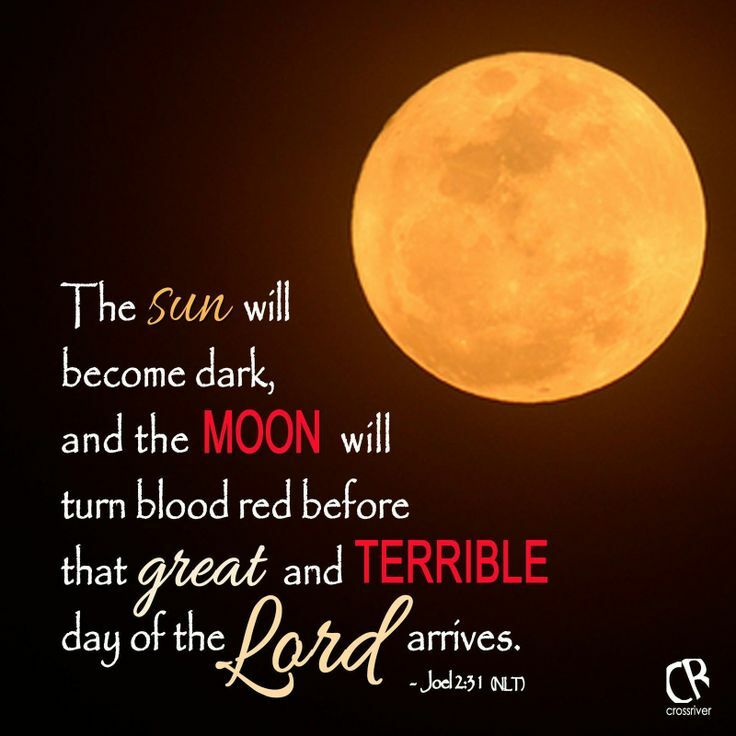 This will also explain in v.30 and v.31 of Joel Ch.2, that the Sun shall be turned into darkness, while the Heavens and the Earth are covered in blood and fire, even the moon will be turned into blood. All this before the great and terrible Day of the Lord comes. This will follow the opening of the sixth seal in the Book of Revelation 6:12. 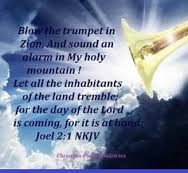 And as Revelation 6:17 states echoing once again Joel Ch.2 For the great day of his wrath is come and who shall be able to stand? Are you prepared beloved, are you ready and living for the DAY of the LORD with a repentive heart? No one has to live in fear of this day, that is, if one repents and gets right with God. Where does that leave you beloved? Will you take your chances that you’re right and God is wrong, that the locusts are imaginary and will not come after you? If you’re not sealed by God, they certainly will. This is not to frighten you, but to warn you, today is the day of salvation, for we are not promised tomorrow. 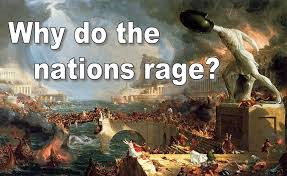 Mystery # 2: The War against God : Valley of Decision, Why do the nations rage? 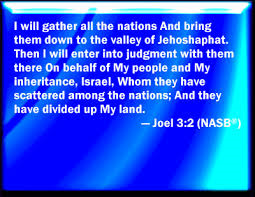 Joel 3:2, I will gather all nations, and will bring them down into the valley of Jehoshaphat, and I will plead with them there for my people and for my heritage of Israel, whom they have scattered among the nations, and parted my land. In today’s MOB we look at Joel 3:2 as we look at the prophetic word concerning the 2 Valleys where God will battle against his enemies. 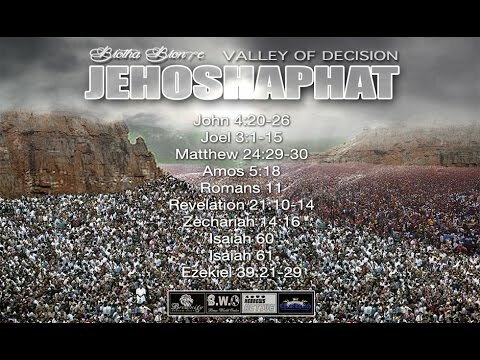 The first Valley we will examine is the Valley of Jehoshaphat also known as the Valley of Destruction. 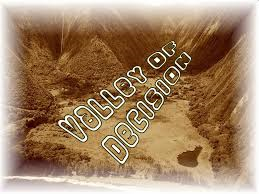 The Valley of Decision is a location in which a very specific event will unfold in the near future. The nations of Earth will gather for a great battle against God and more specifically Jesus Christ the Lord and his army. 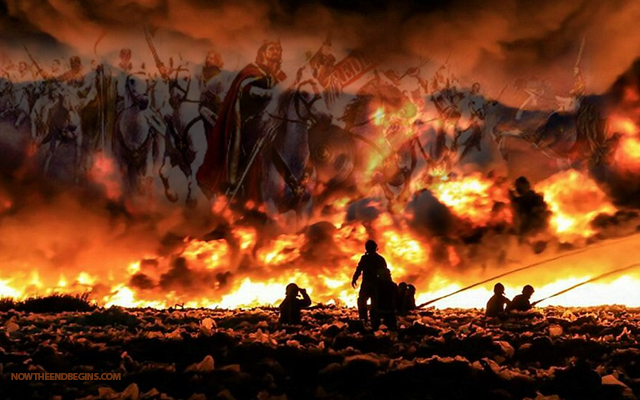 We have another depiction of this battle in Revelation Ch. 19:19 And I saw the beast, and the kings of the earth, and their armies gathered together to make war against him that sat on the horse, and against his army. 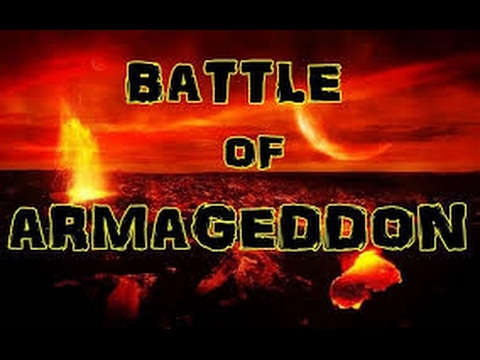 and compare the similarities to the battle and judgment of God that will take place in this prophetic location. 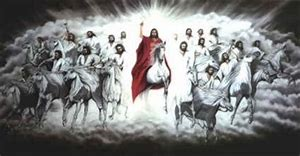 Going back to the description from Revelation 19:19 it is clear that we have a battle ensuing here between the Kings of the Earth, and their armies gathered together to make war against the one who sits on his horse (Yeshua) and his army. 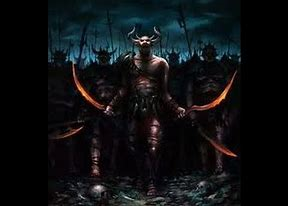 We see in Joel 3:9 a proclamation of war, to prepare for war and for the men to beat their plowshares into swords and their pruning hooks into spears. These are the heathen, we are told that are gathering together for battle and they are to gather in the Valley of Jehoshaphat. God’s Plans are to judge the heathen accordingly; for their wickedness is great. 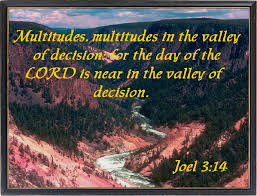 How large is this humongous crowd, V.14 of Joel 3 states, Multitudes, multitudes in the valley of decision: for the day of the LORD is near in the valley of decision. 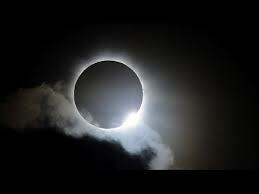 The Sun and the Moon shall be darkened, and the stars shall withdraw their shining. So we see this event, this epic battle also coincides with the Day of the Lord. We also read that the Heavens and the Earth will shake and the Lord himself shall roar out of Zion, from his Holy Mountain. There will be much desolation from the ravages of war and what God will do upon judging the wicked and unrighteous that have refused to repent of their sins against God and one another. 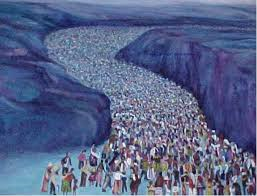 We know that Egypt and Edom (present day Jordan) will be desolate. 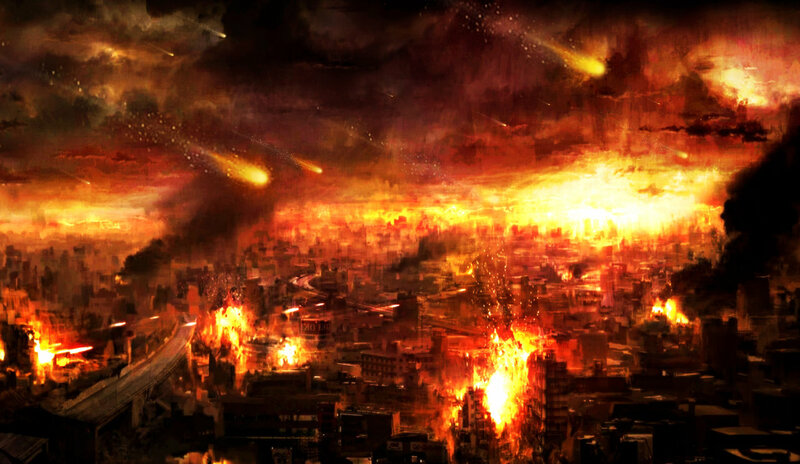 All this will be God’s way of cleansing both Judah and Jerusalem from it’s sin. What we have here is really the Antichrist spirit that is alive and well among us today. We can see the resentment building of the things of God, in these last days. Woe to those who call evil good and good evil. will build up into huge numbers and who knows what other monstrosities await to fight against the Lord and his army. 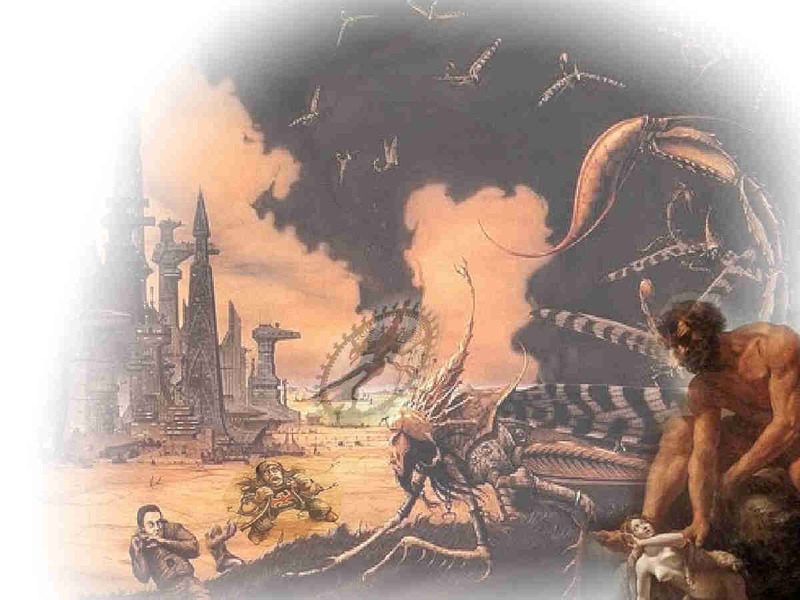 Fallen angels, the Nephilim, and their hybrid offspring are possibilities of additional satanic warfare that could go against God. God will vanquish the enemy for he has overcome the World and he will certainly overcome the Antichrist’s army sent to destroy him. At this Valley of Judgement, before the ushering in of the millennial kingdom, where the swords will be beaten back into plowshares, the Lord God will rebuke the nations and the Kings of this Earth, decisively. This Valley of Decision at Megiddo is also known much more as the place of Armageddon. God will make the rulers and all those that follow them decide whether they are for God or for God’s Enemy, the Antichrist. God wants all the people involved to be able to make the wisest choice possible (in choosing the Lords side). 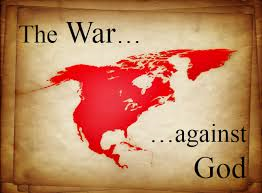 after all, it has been Satan’s plan pretty much from the beginning to get the armies of the World united together to battle against the Lord God Almighty. So it is that in the Valley of Jezreel is indeed the Valley of Decision. No less than 34 bloody conflicts have been fought at the ancient hill top site of Megiddo which overlooks what is known as Jezreel Valley. Megiddo features 20 cities all built directly on top of one another and this was sometime around 3000 to 300 BC. The Valley of Jezreel is also Satan’s last stand; it will be the war to end all and is the culmination at the end of The Great Tribulation. 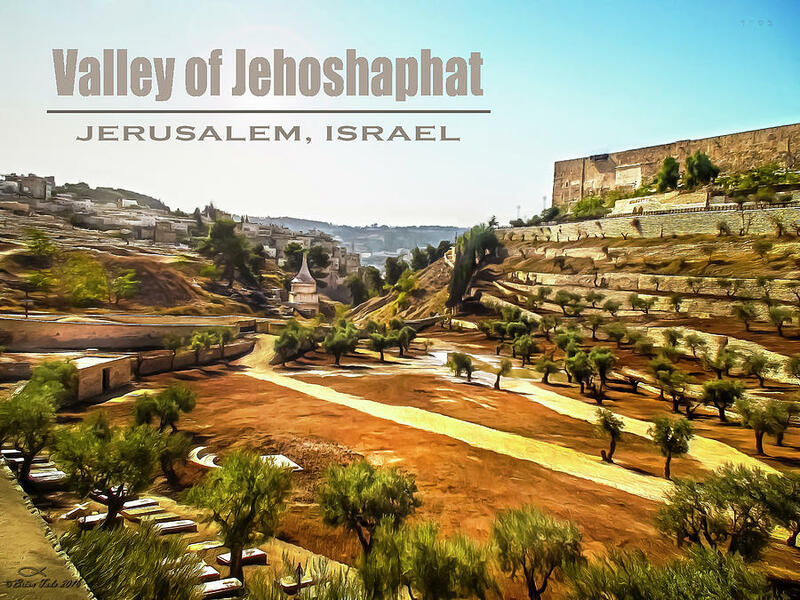 This Valley which is part of the Kidon Valley along with the Valley of Jehoshaphat and is part of the Valley lying between the Temple Mount and the Mount of Olives. The name of Jehoshaphat means “Jehovah is Judge”. This is the place where the Lord’s end time judgment will be upon the enemies of Israel. 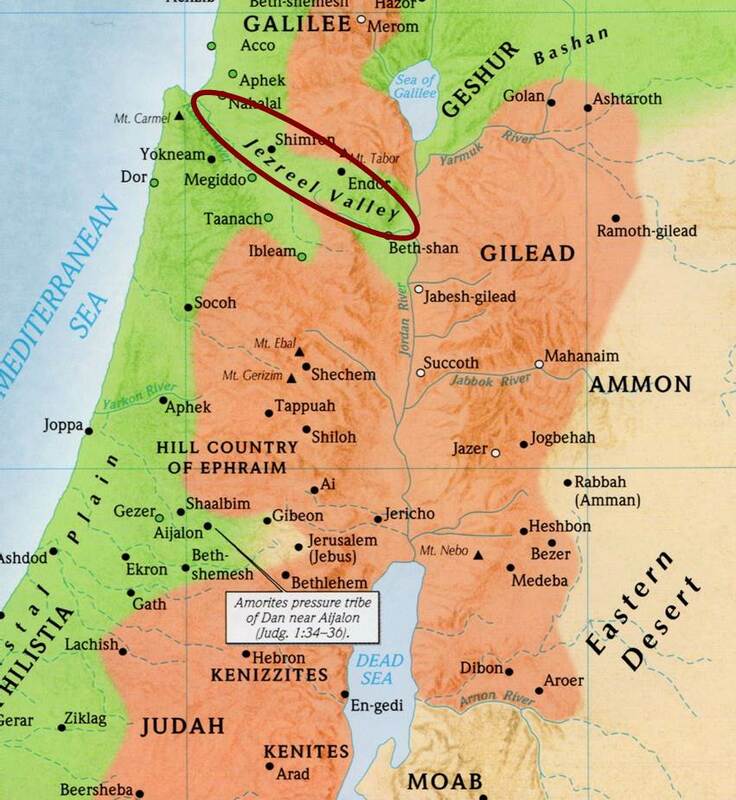 The Valley of Jehoshaphat connects the Kidon Valley to the Valley of Hinnom (the Valley of Graves). King Jehoshaphat was an ancient King of Judah and was the son of Aca. He was 35 years old when he became King, and he reigned for 25 years in Jerusalem from about 843 BC to 848 BC. King Jehoshaphat ended up in a war with the heathen in Jerusalem The Lord reminded him that, it was the Lord’s battle to win. The Lord God brought victory to King Jehoshaphat as well as Judah so we can know then that the Valley of Jehoshaphat is the battlefield for the Lord and just like the Valley of Armageddon, both Valleys are where the nations will be judged. The Valley of decision will indeed be a great turning point for both Israel and the whole world. In Jehoshaphat’s day, Jerusalem rejoiced in their great and miraculous victory and so it will be in these very last days that the Lord will once again fight against Israel’s numerous enemies in the Valley of Decision. 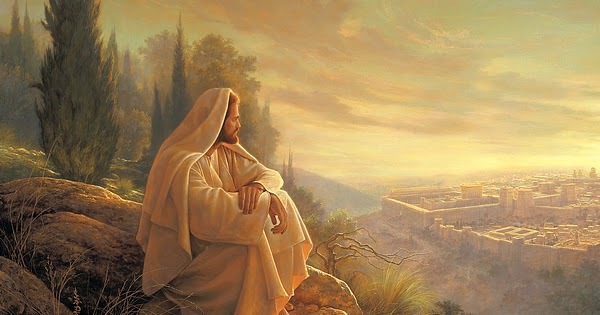 Yeshua Ha’ Mashiach will restore his dwelling place as the mountain of Jerusalem. After God delivers the Victory, the millennial Kingdom will be ushered in and for a thousand years there will be peace and rest on the Earth and all nations remaining on the Earth, shall serve the Lord. The gates of Hell shall not prevail, the Antichrist and his minions shall fail, and Satan’s plan will not succeed. The day of decision is near beloved, what side will you be on? Choose you, this day whom you will serve, God or the little god of this Earth, Satan. Choose this day, while you still have the time to choose. Soon the Lord will be separating the goats from the sheep, which one is you beloved? Amos 5: 18, 20 Woe unto you that desire the day of the LORD; to what end is it for you? 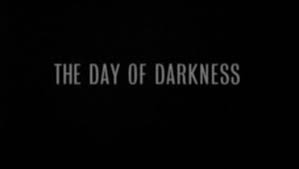 The day of the LORD is darkness, and not light. Shall not the day of the LORD be darkness, and not light? even very dark, and no brightness in it? had become complacent with God. They started to think too highly of themselves. They figured because they had the Holy Temple (where God dwelt) that they would always have God’s Protection, no matter how they lived or conducted themselves. Nothing of course, could have been further from the truth. What Israel had done is created a false delusion for themselves and in fact, the people were now taking for granted God’s Holiness and for that matter, the Day of the Lord. They assumed the day of the Lord would be a day of triumph for them. The prophet Amos however was there to remind them that because of Israel’s unbelief and their wickedness, the Day of the Lord meant it was going to be a Day of Judgment for Israel along with all the other nations. So we choose the subtitle, taking the things of God for granted for an obvious reason. How many of the body of Christ, are taking God for granted and have been taking God for granted for some time? Just like the Israelites had the Holy Temple some Christians fall back on the fact that they have grace, but we all know that it is not a license to sin. For Christ expects much fruit to come from a spirit filled life and we know he is the gardener that cuts the branches that bare no fruit. This has nothing to do with a works based salvation argument or even a once saved always saved debate, we are simply dealing with those who take God for granted, perhaps even in a subtle way. For example, do we say sometimes to ourselves, that God will understand or accept my 2nd best instead of my best, since he knows I mean well. Does God give us his second best when our Holy Father gave his only begotten son as a once and for all perfect and complete sacrifice for us? He gave us his best and he gave us the best blessing possible, eternal salvation and redemption, so that we can spend eternity bathing in the light of his glory. We really deserve hell and damnation don’t we? But what about the darkness? 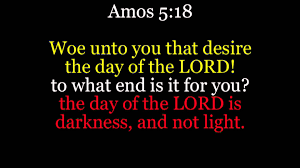 In Amos 5:18, Amos comes down hard on the Israelites for thinking they want the Day of Lord to come. 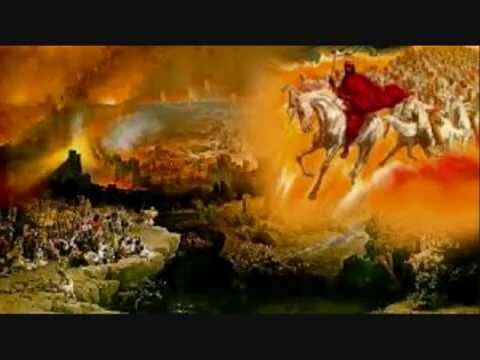 It’s almost like today, with some Christians who say they can’t wait for The Great Tribulation and the Great White Throne of Judgment to take place and then all those that did injustice and wrong to them, they will “get theirs” and they will get revenge and justice through God’s Holy Vindication. Well maybe some others who never dreamed it possible, might have the tables turned on them and might “get theirs” as well. 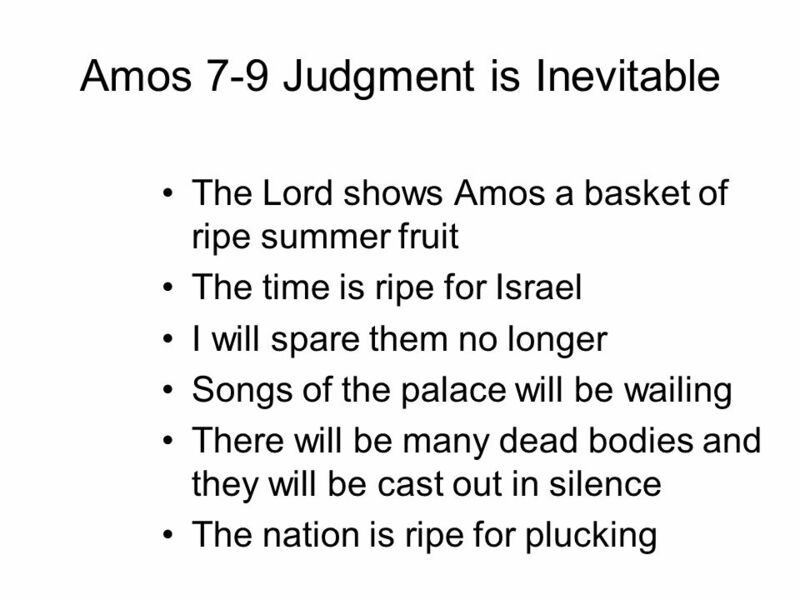 Amos is reminding the Israelites that the Day of the Lord is nothing to look forward to. 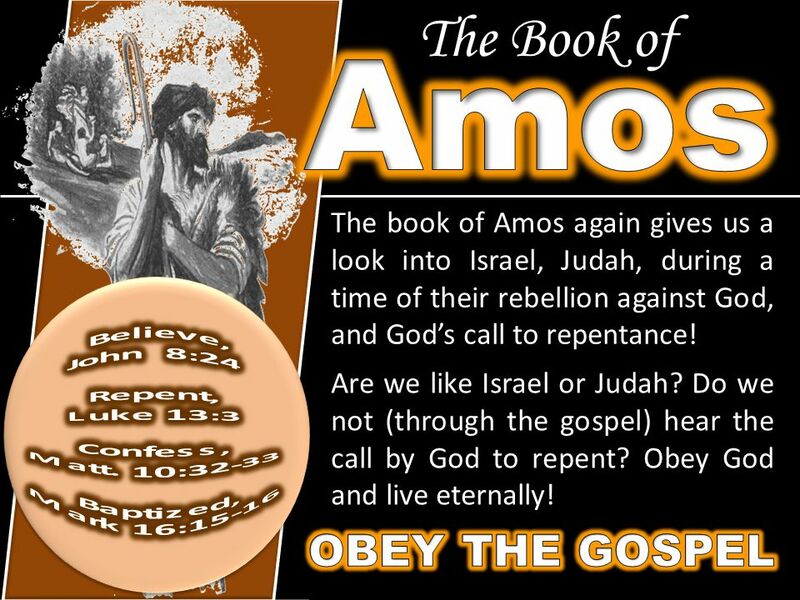 In fact Amos goes on to say that Israel has attempted to make a mockery of God to the point that God despises the Israelites even having the audacity to carry on the feast days despite their ongoing sin and wickedness. God despises their burnt offerings and despises their songs of “supposed” dedication to God. For judgment will come from a righteous God who is not fooled by such vain trappings and the charade that they put on. How many of the body of Christ or those who say they are Christians, go to Church regularly on Sundays, only to live it up for the World Monday through Saturday? Sunday Church going then becomes a masquerade and a charade in outward appearance but God isn’t buying it. These are fake Christians. 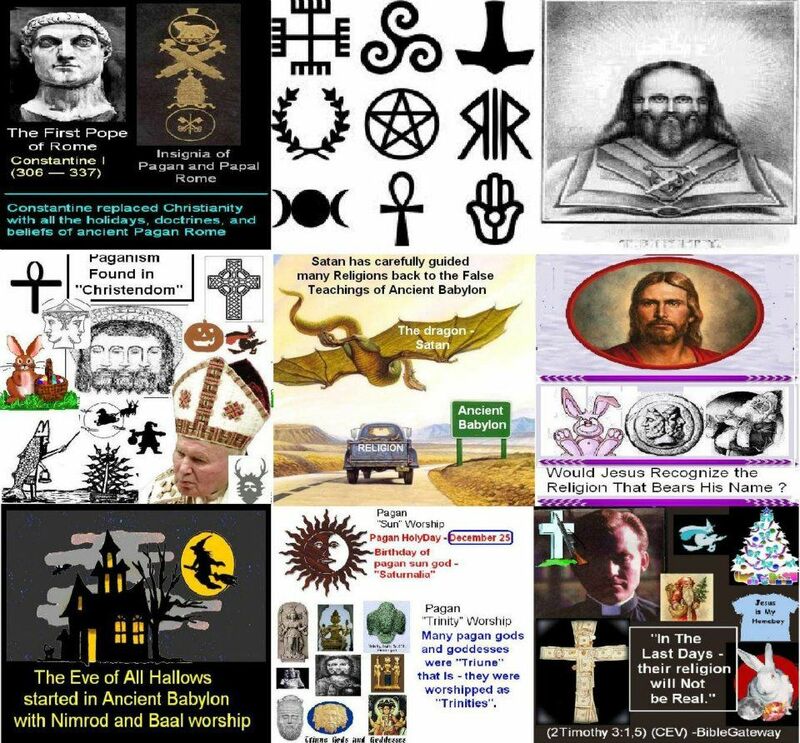 the gods of the underworld and of Satan including his 5 pointed star (yes the same star that is claimed to represent the state of Israel). It is these false satanic gods that are truly being honored and worshiped by Israel and some of that same satanic worship has entered into church doors. Yes the Devil is alive and well in some pulpits he feels very comfortable on Sundays, when the so called men of the cloth do his bidding and the sheeple in the pews barely blink an eye concerning false doctrine and demonic activity clearly on display. These deceivers and those being deceived have taken God and recreated him into a package of their liking, a package they feel comfortable with. It however is not the Holy God of Abraham, Isaac and Jacob. It’s not the Holy God, the Heavenly Father. Zephaniah 1:7 states hold thy peace at the presence of the LORD God; for the day of the LORD is at hand; for the LORD hath prepared a sacrifice, he hath bid his guests. 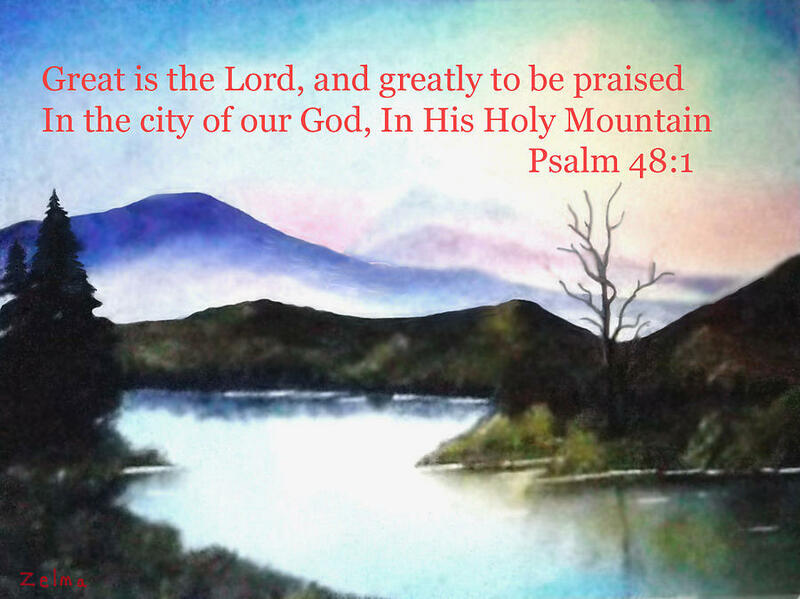 What the Israelites failed to see is that God needed to purge Israel of it’s sin, despite reminder after reminder of God’s Holiness, Israel took that Holiness for granted. Do we not do the same today? Sometimes taken to the extreme, taking God for granted can lead to incredible blasphemy. We must not forget God always has a plan; he has a plan for each and every one of us, if we are willing to buy into his plan to redeem us. It begins with purging us of sin that is the only way true restoration can take place. This happens only when we invite Christ into our hearts and ask him to change us from the inside, to forgive our sins. Our part of the “deal” is we show God, we are serious and we mean business, by repenting of our sin. 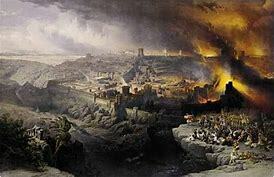 The apostate people of Israel and Judah had to be constantly reminded that the Day of the Lord would be a time of judgment, not just for Israel and the World and for all the ungodly, it would be a time of true utter darkness. However the Lord has prepared a sacrifice as we just read in Zephaniah 1:7 and that sacrifice is none other than Yeshua’s atoning work on the cross of Calvary. God will bid his guests, he will invite as many as will hear the invitation, to come and accept his offering and establish a right relationship with him. It’s God’s will that none should perish but all will come to a saving faith in Yeshua, our Lord. So despite the temple, despite the church, all that removed, it still comes down to that relationship with God and the savior, and that is one thing you never want to take for granted, beloved. Amos 7: 1 Thus saith the Lord GOD showed unto me: and behold, he formed grasshoppers in the beginning of the shooting up of the latter growth; and lo, it was the latter growth after the king’s mowings. What a desolate place Israel was going to become after the King had already taken his share for the collection of taxes, the crops were going to become completely desolate once the locusts were going to come forth. In today’s MOB we look at how God gave the Prophet Amos 3 visions on how Israel would be destroyed. Now obviously this destruction was to be in the future, so it was prophetic but more importantly, it was not a permanent destruction. In fact judgment would soon be facing Israel for it’s sins during the captivity by the Assyrians. Judgement was right around the corner. However this judgement was an impactful and significant destruction of the crops which Israel depended on for their livelihood and commerce as well as to survive on for food sustenance. So spiritually, physically and economically, Israel would be impacted in every way imaginable. There are three visions of note in Amos 7. The first vision is that of locusts. We often hear about Locusts in the Bible when it comes to times of judgement. 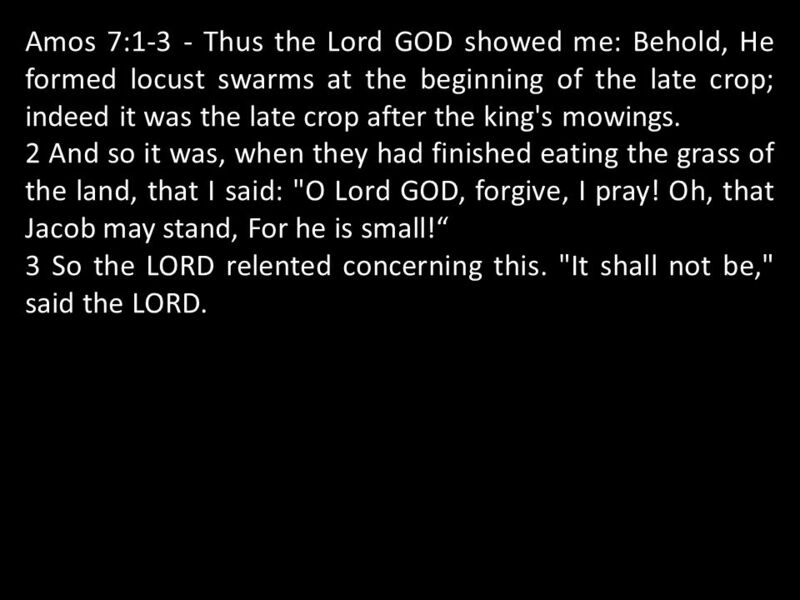 God created locust swarms that ate all the crops that the Israelites had been looking to harvest. Amos is a prophet that has great empathy for the suffering of his people and asks God to consider Israel’s sins and frailty (as described as Jacob, the smallest son in Isaac’s family). The Lord relented after Amos had prayed to him. This shows the power of prayer and that God is moved by prayer and supplication. The second vision is the vision of fire. A great fire has consumed and devoured a large territory of Israel in this vision. Again Amos prays about Jacob (Israel) being so small and helpless. The Lord relents once again about the judgment of fire. Amos has pleaded with the Lord for many lives to be spared now (for both visions of the locusts and the fire), but a third vision awaits him. This third vision is the vision of the plumb line. The Lord stands on a wall with a plumb line in his hand. 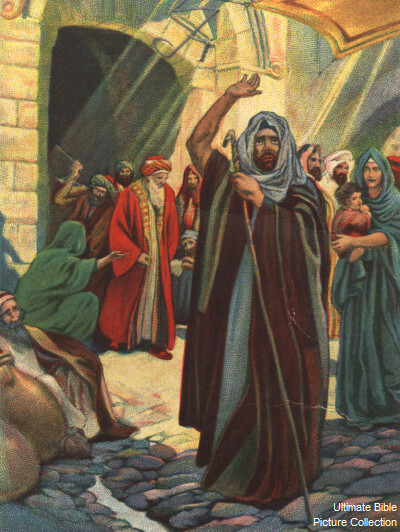 The Lord tells Amos he’s going to set a plumb line in the midst of the people of Israel. God promises to not pass by there anymore, and even the high places of Isaac will be desolate and the sanctuaries of Israel will be laid to waste. Why a plumb line, you ask? A plumb line measures a wall to see if it is built straight and God was measuring the people of Israel to see if they would be straight (in other words would they be honest with God about their sin) against his standard. Essentially the plumb line was to serve as the measure of Israel’s sin to reveal how far Israel had gone astray. The ultimate judgement by God would be soon coming, as Israel would be put into captivity by the Assyrians. God in fact promises, Israel will be judged by the sword because Israel is found to be crooked against the plumb line standard that he expects. So there it is, 3 visions that the Lord has given the Prophet Amos, for the purposes of showing God’s Desire to purge Israel from it’s sin. Let’s not forget one other important take away here, and that is God relented, not once, not twice, but three times. 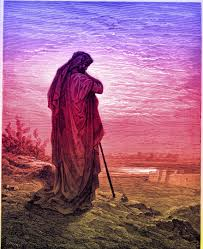 Remember when Abraham pleaded with the Lord to have mercy concerning the destruction of Sodom and Gomorrah? How many times did the Lord relent? 6 times is the answer. 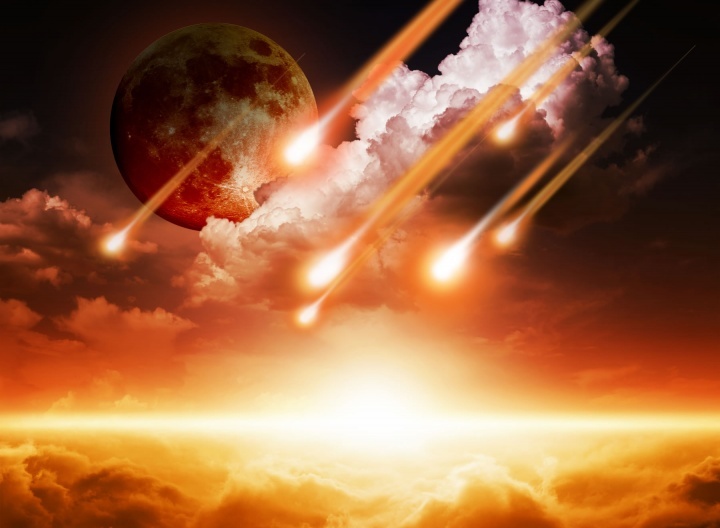 So while God is full of Holy Vengeance and he is always seeking Holy Judgment and he does certainly seek that, when those he has chosen for some special blessing have become wicked, sinful and rebellious. However God is also full of mercy and grace as well beloved. We are not to provoke the Lord; we are not to test the Lord, for he will display his righteous indignation, if he needs to. Abraham, remember was a friend of God’s and God knew his heart, his intentions and his motives. Abraham desired God’s Mercy and because his intentions were in keeping with God’s own desire (that none should perish). God honored Abraham’s intentions. Does God honor your intentions beloved? He knows your heart. He knows when to be judgmental and he knows when to be merciful as well to you. He knows our hearts are deceptively wicked, come clean with God, establish a straight plumb line with him and he will honor your request, your petitions and the desires of your heart. Proverbs 3:5, Trust in the Lord with all your heart and lean not on your own understanding; in all your ways submit to him, and he will make your paths straight. Amos 8: 1-2 Thus hath the Lord GOD showed unto me: and behold a basket of summer fruit. And he said, Amos, what seest thou? And I said, A basket of summer fruit. Then said the LORD unto me, the end is come upon my people of Israel; I will not again passby them anymore. 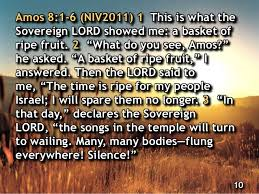 The basket of summer fruit is God’s Way of showing the Prophet Amos, that Israel is indeed ripe for judgment. We know what form the judgment will come in, as well. It is the day the Sun goes down at noon. Has that ever happened in the history of the Earth? Well, if you read, we had the Sun stand still at one time. If you recall that took place at the time when Joshua spoke to the Lord and the Lord delivered up the Ammonites to the Israelites. The Sun did indeed stand still over Gibeon and even the Moon stopped on that day. Scripture in Joshua 10: 12-14 goes on to say that there was no day like that ever before, nor will there ever be another day like it to come. So if there isn’t another day like that, then what is this day where the Sun goes down at noon? 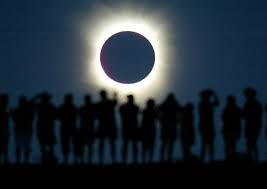 What makes this event unique, is it’s not really a solar eclipse that we are dealing with here. We know this because we are told that the Sun is actually going down and is setting, like it would normally do but in this instance, it is doing so at an incredibly rapid and supernatural time frame (almost instantaneous). 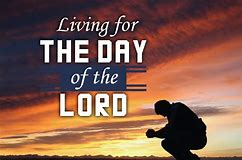 This is the Day of the Lord and in V.9 the Lord says this, And it shall come to pass in that day, saith the Lord GOD, that I will cause the Sun to go down at noon, and I will darken the Earth in the clear day. The Lord goes on to say he’ll turn their feasts into mourning, their songs into lamentations. The Israelites will be in mourning even with sackcloth, as one mourns their only son (like the Father’s only begotten son that he was extremely pleased with, the Lord Jesus Christ when he died on the cross). It is indeed a bitter day that will include famine in the land. The famine will be a spiritual one; the words of the Lord will not be heard. No one shall be able to hear or seek the Word of God. This is the basket of ripe fruit and Israel is indeed ripe for the judgment of God which will come on the Day of the Lord. This judgment will not just be for Israel, it will also be for an unbelieving and sinful and rebellious world. They too, will experience the Sun going down at noon and they too are ripe for the judgment of God. The worst part of the judgment is not the darkness though it is the spiritual famine, that those under the judgment of God will not even hear the gospel message, they have been under the great delusion, so that they believe the lie and have reprobate minds. 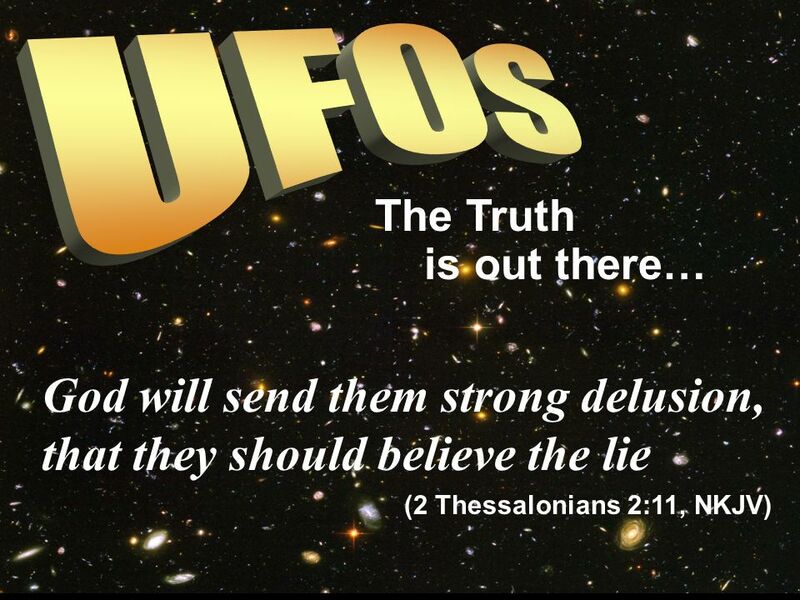 2 Thessalonians 2:11 states, And for this case God shall send them strong delusion, that they should believe a lie. So what is the lie then? The lie is a number of chief lies such as the denial of the deity of Christ, that God does not exist, that there are many pathways to God, that man has the divine locked within him, that the Alien (the Fallen Angel demonic offspring) are the Ascended Masters and our Creators and that the Antichrist is the true god (as backed up by his lying signs and wonders, courtesy of Satan) and that Good is evil and evil (the occult) is good. 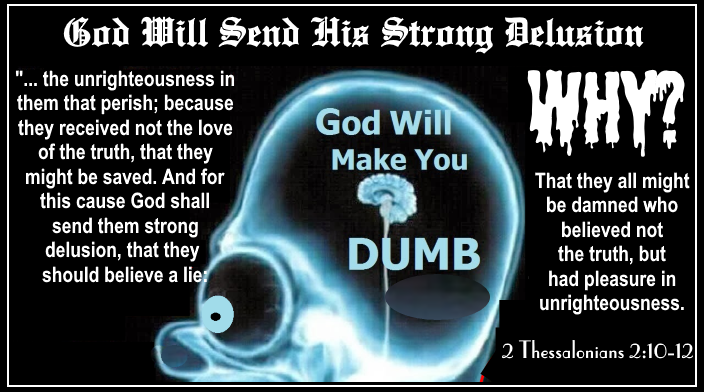 Romans 1:28 says, And even as they did not like to retain God in their knowledge, God gave them over to a reprobate mind, to do those things which are not convenient. The strong delusion, the reprobate mind, the spiritual blindness or famine, it’s all part of God’s end time judgment upon the wicked. 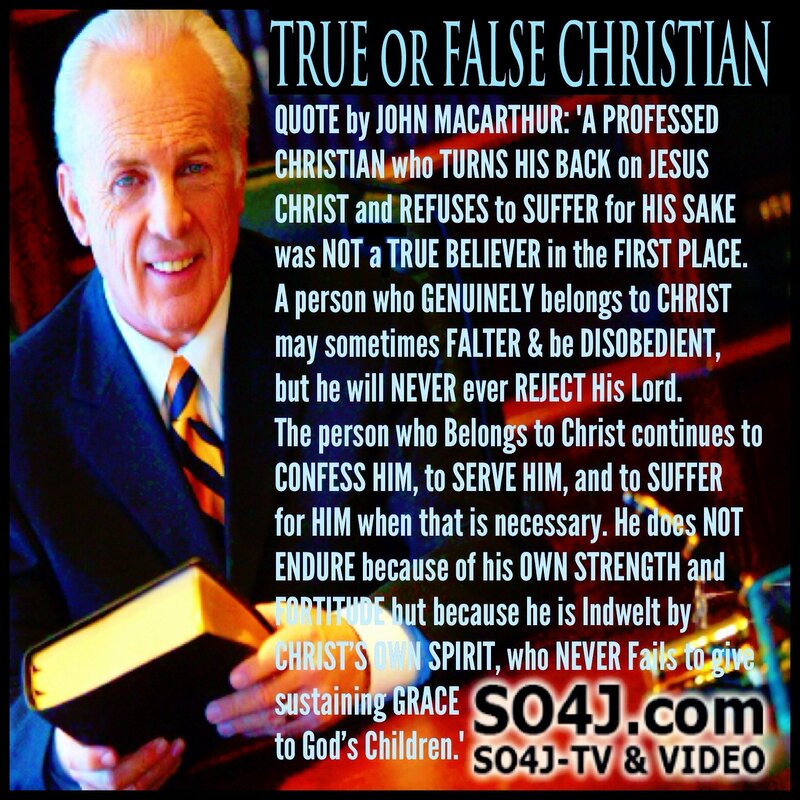 Again this is not just for secular or non-believing Israel, this is for all in the World who are not true “sold out for Christ” born again believers. Anyone not sealed in the forehead, sealed by the Holy Spirit and written in the Lambs Book of Life will not be counted worthy to escape the judgment forthcoming in The Great Tribulation. Revelation 9:4, And it was commanded them that they should not hurt the grass of the earth, neither any green thing, neither any tree; but only those men which have not the seal of God in their foreheads. We have covered all of this previous MOB’s, in the gospel of John 12:39-40, John himself quotes the Prophet Isaiah saying the reason that some refuse to believe is that He has blinded their eyes and hardened their heart, so that they might not perceive with their eyes, and understand with their mind and turn, and I would heal them. 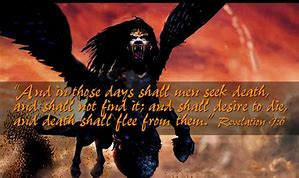 The reprobate will not understand the times, they will not even detect the Antichrist, they will not know of the approaching Great Tribulation or be ready for the Day of the Lord. They will be caught off guard on the day when the Sun goes down at noon. They are blind spiritually as such and need the Grace of God, to truly be able to “see”. So many are blind and trapped and living a life of false ambition, how truly sad. For Satan is the god of this World and he has blinded the minds of those who don’t believe, they are unable to see the glorious light of God. People are perishing from a lack of knowledge and wisdom, beloved. Help pull back the veil for the unbelieving for the fruit may be ripe in this world and God’s Judgment soon coming, but also never forget the fields are white with harvest, but the laborers are few. We need more laborers for Christ to bring in the souls for the harvest and the Glory of God. 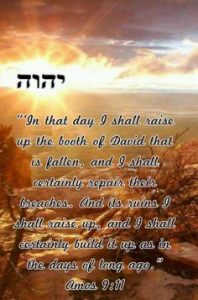 Amos 9:11, 12 In that day will I raise up the tabernacle of David that is fallen, and close up the breaches there of; and I will raise up his ruins, and I will build it as in the days of old. That they may possess all the remnant of Edom, and of all the heathen which are called by my name, saith the lord that doeth this. The remnant of Edom was a prophetic disclosure of the Lord to the Prophet Amos, that spoke specifically about a future time when God would deal directly with the gentiles and bring them to Salvation. Later on, the disciple of Jesus, James who was the leader of the church in Jerusalem, quoted these verses to show how Amos prophecy was being fulfilled because the number of Gentiles who believed in Christ the Lord was rapidly increasing. We turn to the Book of Acts now ch.15 where we read in V.14, Simeon hath declared how God at the first did visit the Gentiles, to take out of them a people for his name. V.17, That the residue of men might seek after the Lord, and all the Gentiles, upon whom my name is called, saith the Lord, who doeth all these things. 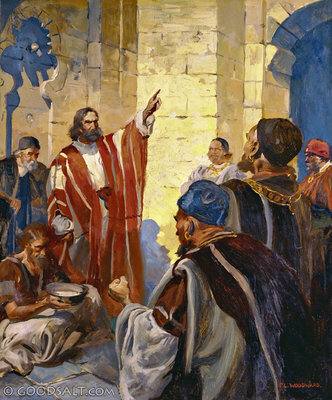 The apostles had acknowledged that there once was a physical circumcision back during the days of the Mosaic Covenant, but now with God turning to the gentiles, God has a spiritual circumcision and the physical one is no longer required, only the Pharisees objected to this to which Peter responded in Acts 15:7 Men and brethren, ye know how that a good while ago God made choice among us, that Gentiles by my mouth should hear the word of the gospel and believe. But before any of this happened, Peter was witness to the pouring out of the Holy Spirit upon the gentiles in Acts 10:45. In Acts 11:1, And the apostles and brethren that were in Judea heard that the Gentiles had also received the word of God. It was then that the disciples and apostles of Jesus knew that God granted the Gentiles repentance unto life. 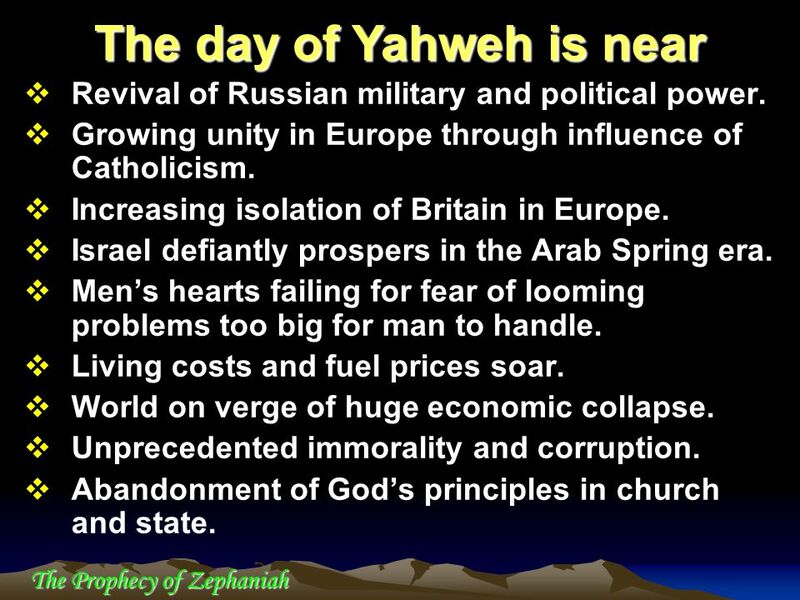 We will examine more of God’s Supernatural awakening of the Gentiles in future MOB’s. 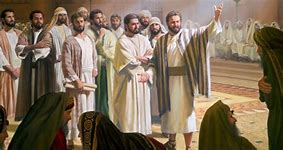 It was God who decided once the Israelites had rejected the Good News, that he would instruct the disciples to now spread the good news to the Gentiles. It was at the time of Saul’s conversion to a believing born again believer of Yeshua that the Lord announced his intentions. In Acts 9:15, But the Lord said unto him, Go thy way: for he is a chosen vessel unto me, to bear my name before the Gentiles and Kings, and the children of Israel. So God always had a plan to reach out to not just the Jew but the Gentile as well. His plan was to the Jew first and then the Gentiles. Edom was a land that was once desolate is the land where Esau once dwelt on the Mount Seir. 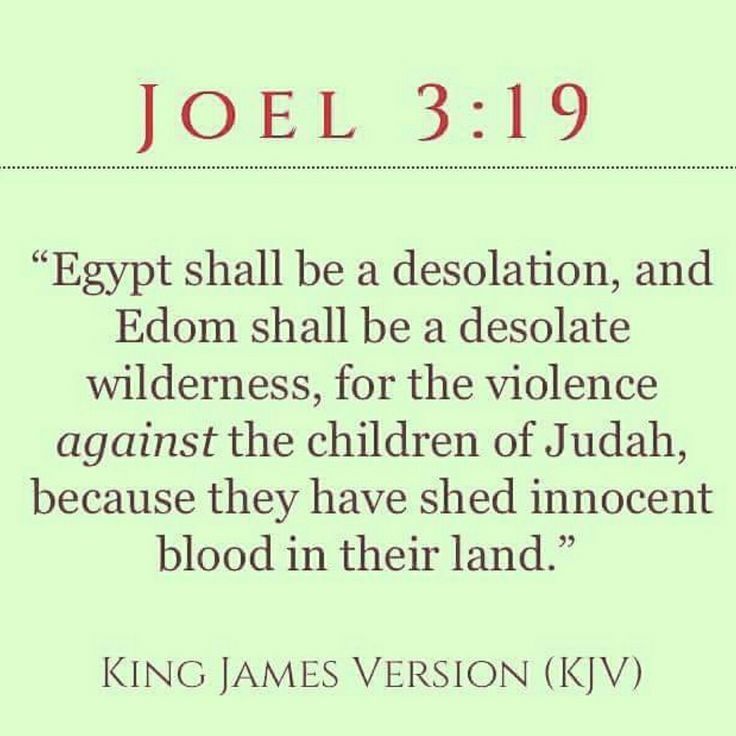 Edom is the seed of Esau, who was the brother of Jacob, the son of Isaac. 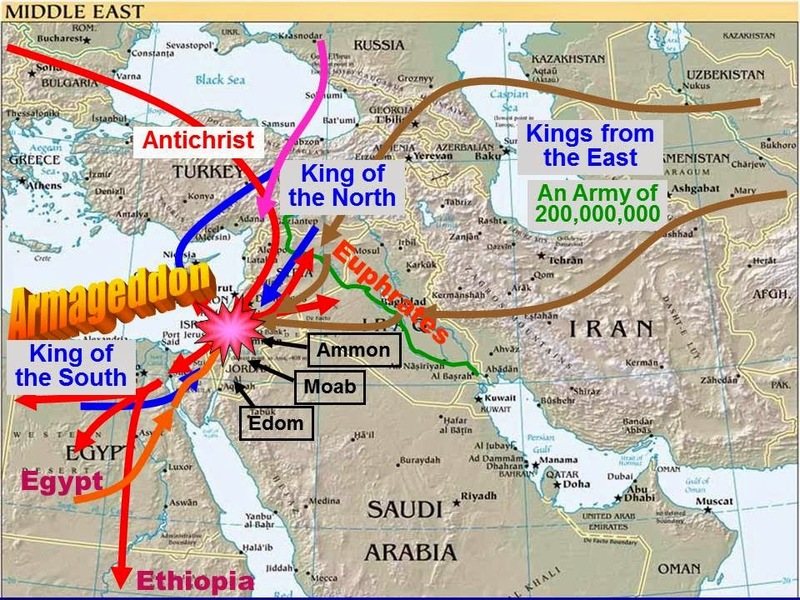 Edom today is located in Modern day Jordan. The remnant of Edom and many of the Gentile nations will come to know Yeshua. Despite the fact that King David had subdued the Edomites, that Amaziah had slaughtered them tenfold, the Edomites were always hostile towards Israel. Those who earnestly seek the Lord, even those from Edom, can seek out salvation through Yeshua. The key is that just like Edom, the Gentile nations, the heathen nations are all on the same footing with God. They all have the same opportunity to accept or reject God’s Grace and plan of salvation. Some argue who and where Edom is this very day. What can be lost is not who and where Edom is but why Edom continues to exist, and for that, the answer is simple. The grace of God is the answer, it is sufficient for Edom, for the Gentiles, and for you beloved.